Exclusive interviews: the two Masters; more. Jodie Whittaker on becoming the Thirteenth Doctor; more. Celebrating 30 years of the Seventh Doctor with Sylvester McCoy; more. 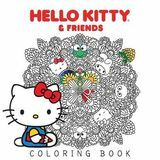 Here's your chance to color Hello Kitty and all her Sanrio friends. Interviews with James Patrick Kelly and Annalee Newitz; Jerry Pournelle obituary; industry news; reviews; more. Over forty stories, each retelling a scene from the original film from the point of view of a background character. Some of the best stories of 2016. H.G. Wells uses his time machine to pursue Jack the Ripper to 1979 San Francisco, where he must save the city - and a lovely young woman - from the depraved killer. Six SF and fantasy tales, including the Hugo-winning title novelette. Ages 8 and up. Full color illustrations throughout. A cosmic event fractured time and space, reshaping Earth. At Diego's middle school in New Chicago are kids from many historical eras and world cultures. The pieces do not always fit neatly, but this is the world Diego loves. Not everyone shares his views. When Diego's engineer father is taken by the Aeternum, Diego must rescue him and stop the evil group from disrupting the fragile peace humanity has forged. The Gage is a mercenary, an automaton created by a wizard around the core of a human. He carries a message from Messaline's most powerful sorcerer to the Rajni of the Lotus Kingdom. With him is the Dead Man, a bitter survivor of the deposed Uthman Caliphate's bodyguard. They are friends, of a peculiar sort. They are walking into a dynastic war between the rulers of the shattered bits of a once great Empire. Delving through the vast Templar archives, Jessop and Mallory come face to face with a secret that could shake Christendom to its core - and take their lives along the way. When a factional dispute on Yakutsk threatens to turn into a shooting wwar, Central Corps and PSI send ships to defuse the situation. But the discovery of a strange artifact sets events in motion that threaten the entire colonized galaxy. Novel based on the game, set in 70 BCE Egypt. In spite of having been ejected from her Canadian school, twelve-year-old Flavia is excited to be headed home to England, where she is soon investigating the death of a reclusive woodcarver. When the world's richest man falls victim to a car bomb, the attack is attributed to terrorists. But was he targeted because, as rumor has it, he was about to fulfill people's dreams of longevity? 479 BCE: The Persians have gathered a new army, returning to Greece with overwhelming force. Divided and outnumbered, the Greeks have only one possible strategy: attack. Publisher's signed edition with signature page tipped in; 'Signed Copy' sticker on front of jacket. After the Third Formic War, the alien threat to Earth was over, and the terraformed Formic worlds were opened to human settlement. The Ministry of Colonization now runs Fleet School on the old Battle School station, recruiting very smart kids to train as leaders of colony ships and colonies. Dabeet Ochoa is a very smart kid, but he has no connections, and doesn't think he has a chance at Fleet School - until the day Colonel Graff arrives at his school for an interview. All families have secrets. But some have more secrets than others. Jim's stories get taller with each glass of whisky. His daughter Sam thinks it's time she found out the truth about her dad. On vacation in Orkney, Sam spies on Jim as he travels across the island. What has he hidden in the abandoned watchtower? Who is he meeting in the stone circle at dusk? And why is he suddenly obsessed with Norse myths? In the Raverran Empire, those born with magic are taken as children, conscripted into the Falcon Army. Zaira has lived her life on the streets to avoid this fate; her rare and dangerous magic threatens the Empire. Lady Amalia, heir and scholar, was born into a treacherous political world. Fate binds the heir and the mage as war looms on the horizon. Full color. A tale of three aspiring comics creators with big dreams, little cash, and publishing rights to one forgotten Golden Age hero: the Escapist.